As we heard tonight, Facebook has officially launched Places, the social network’s location-based platform. We know what Places will mean for Facebook users. Users will be able to check-in to Places (created by both people and businesses) via the web or through mobile apps. And the feature has an API so partners like Foursquare, Gowalla, Yelp and Booyah can allow their users to check-in to Facebook’s places. But what does this mean for businesses? Interestingly, Facebook seems to actively be targeting advertisers on the network. It is already distributing a how-to guide for registering a Place page for their businesses, the benefits and more. You can find the guide here and we’ve embedded the document below. Places creates a presence for your business’s physical store locations- encouraging your customers to share that they’ve visited your business by “checking in” to your Place. When your customer checks into your Place, these check-in stories can generate powerful, organic impressions in friends’ News Feeds, extending your brand’s reach to new customers. Of course, many advertisers and businesses may be confused about the need for both a Page and a Place. But those can be merged. However, Facebook says that not all advertiser Pages and Places can be merged at this time and those businesses who should merge, will be contacted directly by Facebook. One incentive that Facebook is using to encourage businesses to create a Places page is advertising. Facebook says that “Once you claim your Place, you’ll be able to advertise it just as you advertise your Facebook Page. To advertise your Place, click “I want to advertise something I have on Facebook” in the ad creation flow and choose your Place from the drop-down menu.” Advertising is completely self serve and seems fairly simple. Currently, you cannot target people who check-in to your Place, but a business can target people who ‘Like’ your Place page if you have performed a Page to Place merge. With these sorts of incentives and a potentially hot new feature that’s will be put in front of hundreds of millions of Facebook members, what advertiser and business wouldn’t want to create a Places page? Many businesses have already been flocking to Facebook as both and advertising and marketing platform, and now they can have their address, map, phone number, PLUS all the public social activity that is going on at a location. A merged Places page will include a considerable amount of information, including the number of check-ins, who checked-in to a place, number of Likes, the Places’ Wall, and more. 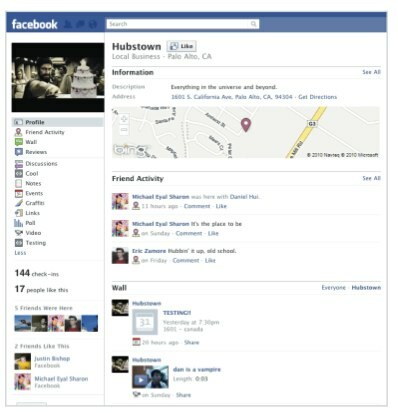 And by creating a social directory of local businesses, Facebook can turn on another massive revenue stream. We know that ad spending on Facebook is expected to be around $1.3 billion in 2010 but Places could boost this significantly as Places lets Facebook tap into the market for local advertising. Of course, the race to create a widespread directory of places is already full of competitors. Between AOL’s Patch, IAC’s CityGrid, and even Google Places, technology giants are seeing the inherent value and revenue that come from having such a platform. But Facebook has two things that Google, AOL, and IAC cannot buy: a fast growing social user base of 500 million members worldwide and advertisers who are flocking in droves to spend money on the network.